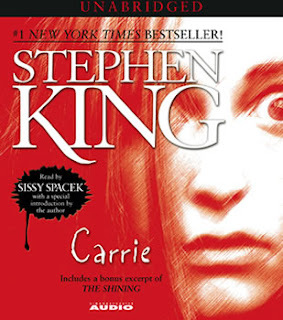 Last month around the amazing schedule Flor and I kept as our wedding approached I managed to tackle a relatively short but classic book from Stephen King, Carrie. Carrie was adapted into a movie back in the 80's and was played by Sissy Spacek in a magnificent performance and I was very surprised to listen to this book as it was narrated by Sissy Spacek also. As many of my readers know I tend to not actually "read" many books but listen to the CD versions of them in mar car predominantly. Anyway, the book was a mere 6 disks long so it was a pretty short read for me and I was able to finish the book a few days before the wedding despite my significant lack of free time. For this reason alone I love the audio book because had I been reading this book conventionally I never would have touched it in those few weeks in early December. There were quite a few differences between the book and the movie and like most books the book contained far more detail and was much more rewarding to finish. I'd have never known otherwise but Carrie basically did 95% of her telekinetic development in the few weeks the book/movie covers. Also, we learn in the book rather than the movie of all that happened in Carrie's past through a documentarians writings. Carrie also finds herself taking her wrath out on the whole town as opposed to just her school in the book and continues of her rampage for hours after the initial blow-up at the school before finally slowly dying in the middle of nowhere due to the wounds of her mother inflicts on her. The book was intense from start to finish and as it was so short I could imagine someone getting sucked in and reading the whole thing in one sitting. It's one of few books lately I've read where I was troubled to put it down due to a craving for more chapters and when it ended I was sitting on my seat. The concept of the book really was quite crazy but the storytelling is so good that you instantly bond with Carrie and care for her. You overlook the ridiculousness of the plot line and feel like it is totally normal despite it's tragedy. I recommend this book to all King fans and to those that don't mind a classic story with a lot of blood and gore.